Please note the coins show staining, and the Reverse Proof has some toning along the rim. Contains the 2011 Silver Eagle Reverse Proof (Proof-70), Regular Proof (Proof-70 DCAM), Regular, West Point and San Francisco issues (MS-70). Description: Please note the coins show staining, and the Reverse Proof has some toning along the rim. 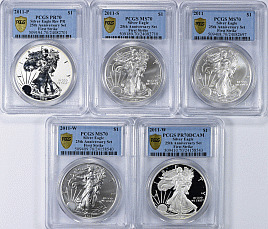 Contains the 2011 Silver Eagle Reverse Proof (Proof-70), Regular Proof (Proof-70 DCAM), Regular, West Point and San Francisco issues (MS-70).